Ferdinand on the left with Isabella on the right. 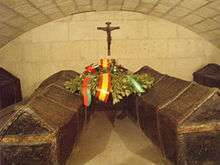 The inscription above identifies them as "Lord Ferdinand and Lady Isabella, Monarchs [reyes] of Castile and of Aragon". The Catholic Monarchs (Spanish: Reyes Católicos) is the joint title used in history for Queen Isabella I of Castile and King Ferdinand II of Aragon. 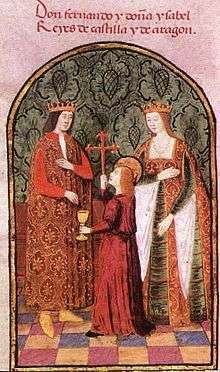 They were both from the House of Trastámara and were second cousins, being both descended from John I of Castile; on marriage they were given a papal dispensation to deal with consanguinity by Sixtus IV. They married on October 19, 1469, in the city of Valladolid; Isabella was eighteen years old and Ferdinand a year younger; this marriage united both kingdoms under one crown. 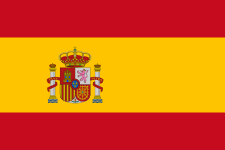 It is generally accepted by most scholars (John Elliott being an English-speaking example) that the unification of Spain can essentially be traced back to the marriage of Ferdinand and Isabella. 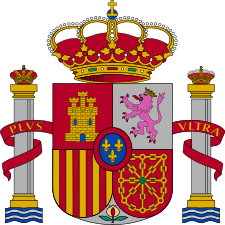 Some newer historical opinions propose that under their rule, what later became Spain was still a union of two crowns rather than a unitary state, as to a large degree Castile and Aragon remained separate kingdoms, with most of their own separate institutions, for decades to come. The court of Ferdinand and Isabella was constantly on the move, in order to bolster local support for the crown from local feudal lords. The title of "Catholic King and Queen" was bestowed on Ferdinand and Isabella by Pope Alexander VI in 1494, in recognition of their defence of the Catholic faith within their realms. Isabella was named heir to the throne of Castile by her half brother Henry IV of Castile in the Treaty of the Bulls of Guisando. She became Queen of Castile in 1474. Her niece, Joanna of Castile, attempted to gain the throne by bringing in the foreign help of Afonso V of Portugal, leading to the War of Castilian Succession. More recently, some speculate that Joanna was the legitimate successor, though Isabella was able to portray herself as such. Isabella's supporters came out ahead in good part due to Aragon's support through Ferdinand, and she officially won in 1479 via the Treaty of Alcáçovas. Ferdinand became the King of Aragon in 1479. Though their marriage united the two kingdoms, leading to the beginnings of modern Spain, they ruled independently and their kingdoms retained part of their own regional laws and governments for the next few centuries. The Catholic Monarchs set out to restore royal authority in Spain. To accomplish their goal, they first created a group named the Holy Brotherhood. These men were used as a judicial police force for Castile, as well as to attempt to keep Castilian nobles in check. To establish a more uniform judicial system, the Catholic Monarchs created the Royal Council, and appointed magistrates (judges) to run the towns and cities. This establishment of royal authority is known as the Pacification of Castile, and can be seen as one of the crucial steps toward the creation of one of Europe's first strong nation-states. Isabella also sought various ways to diminish the influence of the Cortes Generales in Castile, though Ferdinand was too thoroughly Aragonese to do anything of the sort with the equivalent systems in the Crown of Aragon. Even after his death and the union of the crowns under one monarch, the Aragonese, Catalan, and Valencian cortes (corts) retained significant power in their respective regions. Further, the monarchs continued ruling through a form of medieval contractualism, which made their rule pre-modern in a few ways. One of those is that they traveled from town to town throughout the kingdom in order to promote loyalty, rather than possessing any single administrative center. Another is that each community and region was connected to them via loyalty to the crown, rather than bureaucratic ties. Ferdinand and Isabella were noted for being the monarchs of the newly united Spain at the dawn of the modern era. They had a goal of conquering the Muslim kingdom of Granada and completing the Christian reconquest of the Iberian Peninsula. The beginnings of a series of campaigns known as the Granada War began with the attack on Alhama de Granada. The attack was led by two Andalusian nobles, Rodrigo Ponce de León and Diego de Merlo. The city fell to Andalusian forces in 1482. The Granada War was aided by Pope Sixtus IV by granting a tithe and implementing a crusade tax to invest in the war. After 10 years of fighting the Granada War ended in 1492 when Emir Boabdil surrendered the keys of the Alhambra Palace in Granada to the Castilian soldiers. 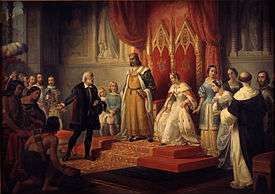 Christopher Columbus at the Court of the Catholic Monarchs by Juan Cordero, 1850. After a number of revolts, Ferdinand and Isabella ordered the expulsion from Spain of all Jews and Muslims. People who converted to Catholicism were not subject to expulsion, but between 1480 and 1492 hundreds of those who had converted (conversos and moriscos) were accused of secretly practising their original religion (crypto-Judaism or crypto-Islam) and arrested, imprisoned, interrogated under torture, and in some cases burned to death, in both Castile and Aragon. The Inquisition had been created in the twelfth century by Pope Lucius III to fight heresy in the south of what is now France and was constituted in a number of European kingdoms. The Catholic Monarchs decided to introduce the Inquisition to Castile, and requested the Pope's assent. On 1 November 1478 Pope Sixtus IV published the Papal bull Exigit Sinceras Devotionis Affectus, by which the Inquisition was established in the Kingdom of Castile; it was later extended to all of Spain. The bull gave the monarchs exclusive authority to name the inquisitors. Many of these claims are thought to be exaggerated as a result of an anti-Spanish and anti-Catholic propaganda phenomenon known as The Black Legend. During the reign of the Catholic Monarchs and long afterwards the Inquisition was active in persecuting people for offences such as crypto-Judaism, heresy, Protestantism, blasphemy, and bigamy. The last trial for crypto-Judaism was held in 1818. In 1492 Ferdinand and Isabella ordered segregation of communities to create closed quarters which eventually became what were later called "ghettos". They also furthered economic pressures upon Jews and other non-Christians by increasing taxes and social restrictions. In 1492 the monarchs issued a decree of expulsion of Jews, known formally as the Alhambra Decree, which gave Jews in Spain four months to either convert to Catholicism or leave Spain. Tens of thousands of Jews emigrated to other lands such as Portugal, North Africa, the Low Countries, Italy and the Ottoman Empire. Later in 1492, Ferdinand issued a letter addressed to the Jews who had left Castile and Aragon, inviting them back to Spain if they had become Christians. They authorized and financed the expedition of Christopher Columbus, who was given the name of Admiral of the Ocean Sea by the monarchs, and who discovered the Americas and brought the knowledge of its existence to Europe. Columbus' first expedition to the supposed Indies actually landed in the Bahamas on October 12, 1492. He landed on the island of Guanahani, and called it San Salvador. He continued onto Cuba, naming it Juana, and finished his journey on the island of the Dominican Republic and Haiti, calling it La Isla Española ("the Spanish Island" in Spanish). On his second trip, begun in 1493, he found more Caribbean islands including Puerto Rico. His main goal was to colonize the existing discoveries with the 1500 men that he had brought the second time around. Columbus finished his last expedition in 1498, and discovered Trinidad and the coast of present-day Venezuela. The colonies Columbus established, and conquests in the Americas in later decades, generated an influx of wealth into the new unified state of Spain, leading it to be the major power of Europe from the end of the sixteenth century until the mid-seventeenth century, and the largest empire until 1810. Isabella ensured long-term political stability in Spain by arranging strategic marriages for each of her five children. Her first-born, a daughter named Isabella, married Afonso of Portugal, forging important ties between these two neighbouring countries which would lead to enduring peace and future alliance. Joanna, Isabella's second daughter, married Philip the Handsome, the son of Holy Roman Emperor Maximilian I. This ensured alliance with the Holy Roman Empire, a powerful, far-reaching territory which assured Spain's future political security. Isabella's only son, John, married Margaret of Austria, maintaining ties with the Habsburg dynasty, on which Spain relied heavily. Her fourth child, Maria, married Manuel I of Portugal, strengthening the link forged by her elder sister's marriage. Her fifth child, Catherine, married Arthur, Prince of Wales and heir to the throne of England, in 1501; he died at the age of 15 a few months later, and she married his younger brother shortly after he became King Henry VIII of England in 1509. Isabella died in 1504. Ferdinand remarried Germaine of Foix in 1505; he died in 1516. 1 2 "Reyes Católicos" is literally "Catholic Kings" rather than "Monarchs", and is sometimes incorrectly so rendered in English; but in Spanish it is usual for the masculine plural to be used in an essentially gender-indifferent way, so for example it is usual in Spanish to call the children of a person or couple "hijos", literally sons, regardless of actual gender, while in English "sons", and "kings", are exclusively masculine. ↑ "Catholic Encyclopedia: Isabella I". Newadvent.org. 1910-10-01. Retrieved 2014-03-01. ↑ Elliot, J.H. (2002). Imperial Spain: 1469-1716. New York: Penguin Books. p. 23. ISBN 0-14-100703-6. ↑ The book "Good Faith and Truthful Ignorance" by Alexandra and Noble Cook provides a prime example of how loyalty to the crown was more important in that period than the specific governmental structure. ↑ Alhambra Decree Archived April 16, 2010, at the Wayback Machine. ↑ McIntosh, Gregory C (2000). The Piri Reis Map of 1513. University of Georgia Press. p. 88. ISBN 978-0-8203-2157-8. Wikimedia Commons has media related to Catholic Monarchs. Edwards, John. Ferdinand and Isabella: Profiles in Power.Pearson Education. New York, New York. 2005.ISBN 0-582-21816-0. Edwards, John. The Spain of the Catholic Monarchs. Blackwell Publishers. Massachusetts, 2000. ISBN 0-631-22143-3. Kamen, Henry. Spain: 1469-1714 A Society of Conflict. Taylor & Francis. New York & London. 2014. ISBN 978-1408271933 ISBN 1408271931.